Chances are most of us have never considered keeping a cockroach as a pet. Yet, there are people who find cockroaches fascinating, and there are species of good-natured cockroaches who don't mind humans petting their brittle exoskeleton. Despite its fearsome title, the Madagascar hissing cockroach, which its human fans describe as hardy, docile, and easy to handle, actually fits that description to a T. The easygoing nature of these survivors makes them well suited to those who are beginners at caring for exotic insect pets. The Madagascar hissing cockroach, Gromphadorhina portentosa, native to the large island of Madagascar off the African mainland, is one of the world's largest cockroach species. In the wild, where these wood dwellers are commonly found living in downed logs. Madagascar hissing cockroaches, or "hissers," are dark reddish brown to black, with a hard exoskeleton and, unlike most cockroaches, no wings. They compensate by being excellent, determined climbers who can even scale glass walls. They are one of about 20 species of large cockroaches on Madagascar, many of which are kept as exotic pets. 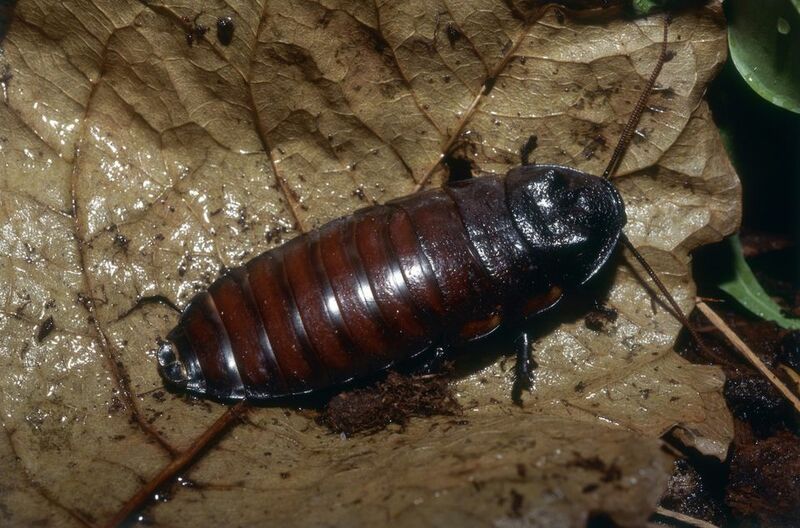 Hissing cockroaches have a pair of modified spiracles (the tubes insects use for breathing) that they use to produce the hissing sound that inspired their name. They will hiss when disturbed and males hiss when courting females. Sometimes a whole colony will hiss in unison, for reasons that are as yet unclear to researchers. Some U.S. states, including Florida, require individuals or institutions who want to keep lone hissers or breeding colonies to have a special permit. If you are raising hissers, it is advisable not to take females, especially pregnant females, out of their habitat to prevent introducing an invasive species into the local environment. A Madagascar hissing cockroach's hissing sound comes from openings in the insect's abdomen called spiracles. They force air through the spiracles to produce all of their hissing sounds; one is used to attract a mate, another is used when the cockroach is feeling threatened (known as the "disturbance" hiss), and the third is used when a male cockroach is preparing to attack another male. It's unlikely that humans can discern the difference among the different types of hiss, but the cockroaches definitely can. A 10- to 15-gallon fish tank will house several Madagascar hissing cockroaches comfortably. Use a secure mesh lid; test it to make sure your determined climbers can't get out and double down by applying a thick coating of petroleum jelly to the first few inches of their habitat. Aspen wood shavings, 1 to 2 inches deep, are a suitable substrate for hissers, who don't like cedar or pine. Provide some hiding places because hissers do not like the light; they will be happy with hiding places as simple as cardboard rolls from toilet paper, pieces of cardboard egg cartons, cork bark, driftwood, and small cardboard boxes. Being tropical creatures, hissing cockroaches are most at home when they're kept at a bit above room temperature; they tolerate temperatures of 75 to 90 degrees Fahrenheit. Make sure your enclosure is secure; while they're not known as escape artists, a Madagascar hissing cockroach could be killed by a fall (or by an unsuspecting human who steps on it). Hissing cockroaches should be fed a variety of fresh fruits and vegetables, including romaine and other leafy greens (except not iceberg lettuce) in combination with a pellet food that's high in protein, such as dry dog food. Carrots seem to be a favorite, along with oranges, apples, bananas, tomatoes, celery, squash, peas and pea pods, and other colorful vegetables. Remove uneaten food after a while to avoid spoilage. Unlike other cockroaches, they won't eat decaying food. Water should be provided in a shallow dish with cotton or some other absorbent material in it to prevent your cockroaches from drowning. Madagascar hissing cockroaches are hardy, just like most cockroaches, and don't have many health issues. One thing to watch for is dehydration; if your pet cockroach looks shriveled or wrinkled, it's probably not getting enough water. Cockroaches molt (shed their outer skin) six times before reaching maturity. This period is when your cockroach is at its most vulnerable; it may not eat the day before a molt as it prepares. Once it reaches about 7 months of age, it stops molting and has reached maturity. These aren't your standard kitchen-invading cockroaches; they're slow-moving and only eat fresh plants (most roaches feast on rotting food). You can buy them on Amazon or from a reputable insect breeder. Basically, if it's not showing signs of dehydration and it hisses slightly when you first touch it (indicating it's nervous), you've got yourself a healthy cockroach. This pet can be a good choice for kids, especially if you're trying to help a child get over a fear of creepy-crawly creatures. If an insect can be "cute," the Madagascar hissing cockroach gets pretty close. It doesn't skitter like other bugs, which is a major fear factor for many insectophobes, and it will tolerate being handled (to a point). If you still aren't sure whether you want to own a pet cockroach, but you are interested in insects, consider a stick insect, tarantula, African giant millipede, or another exotic pet.